President Erdogan announces that Turkish flag hoisted in the center of the Kurdish-dominated Syrian city of Afrin. Turkish forces and Free Syrian Army (FSA) rebels captured the center of Afrin in northwest Syria after Kurdish fighters who were in control evacuated the city in order to fight another day. Turkey’s military said in a tweet on Sunday that troops were searching for landmines and other explosive devices in the area. “Many of the terrorists had turned tail and run away already,” President Recep Tayyip Erdogan said in a speech in western Turkey. He announced that Turkey-backed forces took complete control of the city center at the 8:30am local time (05:00 GMT). He said 3,603 “terrorists had been neutralized” in Afrin since the launch of the cross-border operation on January 20. Erdogan said the Turkish flag and the flag of the Syrian opposition fighters were raised in the city, previously controlled by the Kurdish militia known as the People’s Protection Units, or YPG. Later on Sunday, limited fighting was reported in some pockets in Afrin. Footage by Turkey’s private Dogan news agency showed Syrian fighters shooting in the air in celebration. In another Dogan video, a Syrian fighter is seen shooting at a statue of Kurdish hero Kawa, a symbol of resistance against oppressors, before a bulldozer pulled it down. 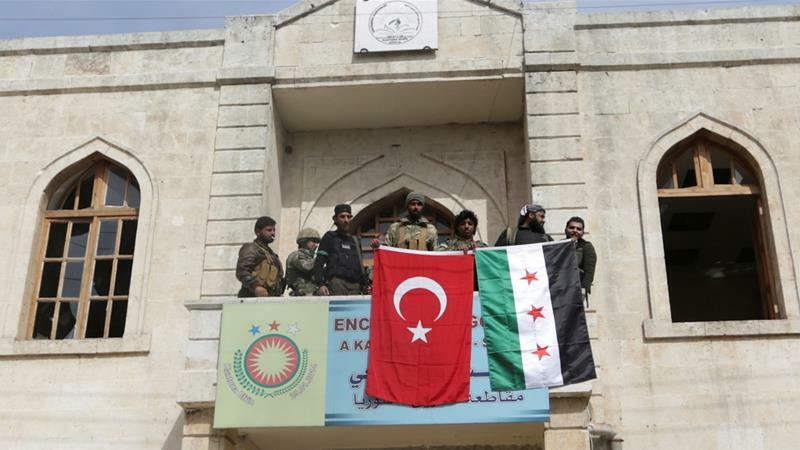 Turkey – together with the FSA – launched the military operation into Afrin in the northwest of Syria to vanquish the US-backed YPG fighters near its border. Free Syrian Army spokesman Mohammad al-Hamadeen said Kurdish forces pulled back to Syrian government-controlled areas around the city of Aleppo, or to the Kurdish-held region east of the Euphrates River. “Maybe [Afrin] will be cleared by the end of the day – it’s empty of fighters, they cleared out,” Hamadeen told Reuters news agency. Afrin’s leaders said on Sunday that Kurdish-dominated forces will shift from direct confrontation to guerrilla tactics. “Our forces are present all over Afrin’s geography. These forces will strike the positions of the Turkish enemy and its mercenaries at every opportunity,” Othman Sheikh Issa, co-chair of the Afrin executive council, said in a televised statement. Other videos and photos shared by the Turkish-backed FSA fighters on social media showed them in residential streets, making victory signs and waving flags. The Syrian Observatory for Human Rights, a UK-based war monitor, previously said at least 150,000 civilians fled the city since last Wednesday. Turkey’s government spokesman Bekir Bozdag said the military campaign would continue to secure areas around Afrin and make sure food and medicine were available. “We have more to do. But the project of building a terrorism corridor and building a terrorist state is over,” he said.